New Mexico Mature Driver Car Insurance Discount & Refresher Program Course for Auto Insurance 3 Year Discount. This course can pay for itself on your next car insurance bill and over and over for 3 full years! 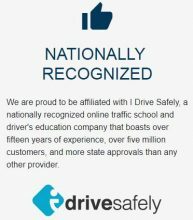 Did you know that, in many states, insurance companies offer policy holders a safe driving discount for taking an online Insurance Reduction course? In fact, insurance companies shall by law in some states to give drivers aged 50 and in some states 55 and older an auto liability Insurance discount for completing the course. In some states, the discount is up to 15%!